Los Angeles, CA – Discover the hero within as the inspirational animated journey headlined by an all-star cast of voice talents including Milla Jovovich (Resident Evil: The Final Chapter, Zoolander), Academy AwardÒ nominee Sharon Stone (Casino), Academy Award winner Whoopi Goldberg (Ghost), Academy Award winner Joe Pesci (Goodfellas) and Will Chase (“Nashville”), HERO QUEST, arrives on Digital HD and Video On Demand March 8, followed by DVD March 29, from Cinedigm (NASDAQ: CIDM). 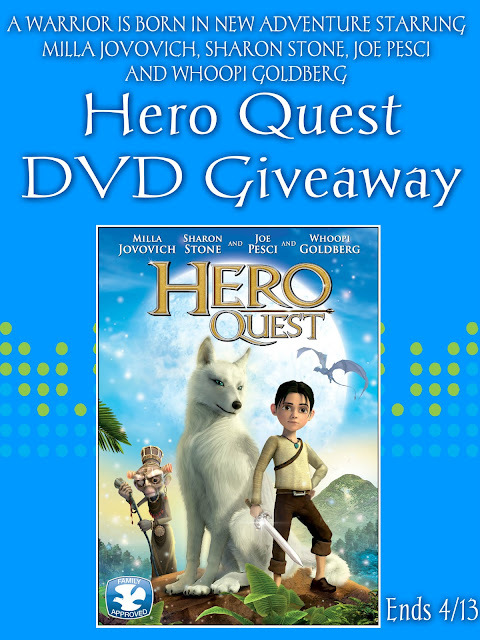 Experience the magic of HERO QUEST with DVD special features that include the film’s official music video featuring Fadeev along with the film’s original Russian audio track. I'd love to see this. What a great cast, and the animation looks awesome. This movie sounds so good, I would like to watch it with my grandson. This looks like a movie I would enjoy watching with my son. I love that this movie is Dove Approved!! This looks like a show my son would like to see. I would love to watch this movie with my kids looks great and they love animals too. looks like one for my nephew! I would like to see this movie with my nephew as soon as possible. I think it will be a fine movie.